Then, stop by the SDK store and pick up the rest of the collection! Love is in the air at SDK, and Sue Wood has added a new kit to the SDK catalog. Love Letters: The Papers contains 16 beautifully textured and butterfly filled papers. Love Letters: The Elements contains frames, ribbons, butterflies, and more and add a whimsical yet romantic look to any layout. Be sure to stop by SDK and pick up this beautiful new kit. Herald has added a new My Valentine Add-on to the SDK store! This add-on pack contains 10 papers and 14 elements in soft, romantic colors and textures that coordinate beautifully with her previously released My Valentine Paper Pack and My Valentine Element Pack. Be sure to stop by the SDK store and pick up the complete collection. Lorie has added this lovely Gift of Love Brag Book Add-on to the SDK store. This set of four 6 x 4 brag book quickpages coordinates with her already released A Gift of Love Kit and makes scrapping your Valentine memories quick and easy. Stop by and pick up this wonderful collection today! New Additions To The Supa Digi Kit! New additions have been added to this month's Baby It's Cold Supa Digi Kit! Be sure to stop by and pick them up! New Products and a Blog Freebie! Cen has a great new Valentine collection available at the SDK store! And Sweet Heart Frames contains heart shaped frames in 2 styles to add the perfect finishing touch to all your "lovely" layouts. Be sure to stop by and pick up this wonderful collection! When you're done shopping, head on over to Cen's blog and pick up Part 6 of her Spice of Life Freebie! Kim's Spicey Alpha comes complete with upper and lower case letters, numbers 0-9, and a question mark and exclamation mark. Hugs to Kim's Scrappin' for creating this great alpha! Have You Stopped By Leslie's Store Lately? If not, then you're missing all of the fantastic new kits she has available in the SDK store! Check out her great new kit Jazzled. Blue jeans with just a touch of pink makes this kit perfect for creating layouts of that little diva in your life! This great Esthetic Tapestries paperpack contains 30 patterned papers in bold, rich colors. These papers add the perfect touch to any layout. Get MOOOOving on scrapping those baby or children's layouts with Leslie's And The Cow Jumped Over The Moon Kit. This fun little kit is sure to bring back some fond childhood memories! Lorie is offering this wonderful little Valentine's Day treat for you on her blog. 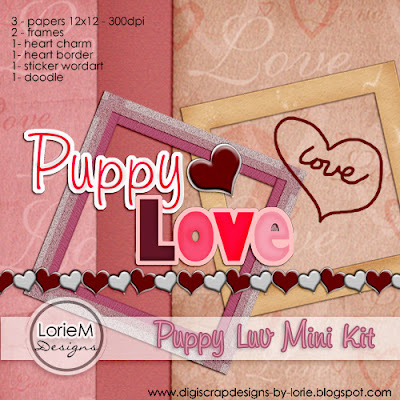 Puppy Luv Mini contains 3 papers, 12x12, 300dpi. 1 plain & two with text designs. 2 cardboard frames, 1 heart charm, 1 love doodle, 1 heart border and a cute puppy love sticker. Be sure to stop by Lorie's blog and pick up this great little mini. And don't forget to leave some love! Hurry on over to the SDK store and pick up these wonderful new designs now available at 40% off! This offer is only good for the first week of release, so be sure to get 'em while they're hot! 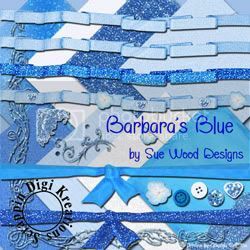 Add a little glitz and glamour to your layouts with Sue Wood's new kit Barbara's Blues. This kit of 8 papers and a variety of elements is sure to bring warmth and sparkle to any layout! 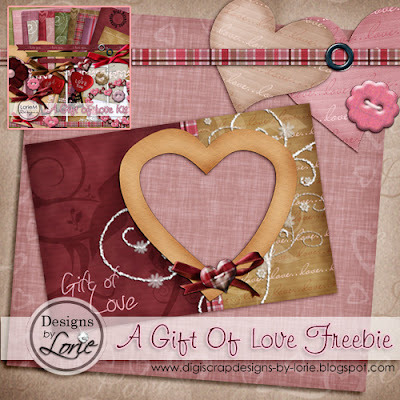 Get ready for Valentine's Day with this great new kit by Lorie. A Gift of Love Kit contains 11 papers and 25 elements in a variety of colors including reds, pinks, and greens. Beautiful and versatile, this kit is perfect for everyday scrapbooking! You & Me...So Happy Together by Doreen Stolz combines elegance and romance to create the perfect Valentine Kit! 17 papers and 39 elements including word art, hearts, and flowers, this kit is the perfect addition to your scrapbooking collection! Herald's Checker Board Photoshop Action for CS2 and CS3 makes it easy to create fantastic overlays with papers that you choose! Great for adding a customized look to any layout! 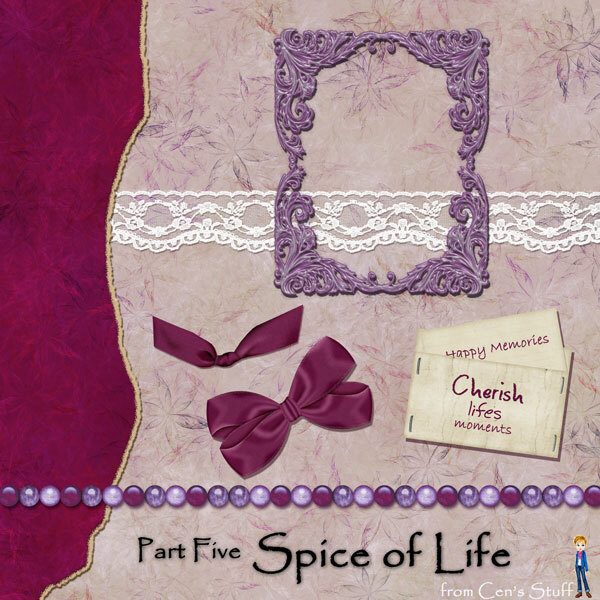 Visit Cen's blog to pick up part 5 of her Spice of Life kit! This part has a little of everything: torn paper, lace, beads, frame, a cute little card and, of course, some more bows!! Click on the preview to go to Cen's blog! This wonderful new kit from Filly in red, pink, and white comes with 10 papers and 30 elements including hearts, flowers, bows, and more! Great for scrapping all of your Valentine, wedding, or 1st love layouts. Click on the preview to pick it up at the SDK store. Have you seen a technique you'd love to try but you just don't know how it was done? Looking for help with specific programs like Paint Shop, Photoshop, or Fotofusion? Well, look no further than SDK's Kreative Help section! SDK offers many tutorials from how to create an album to how to use brushes, actions, sketches and more! Stop by and check out what we have to offer or share a tip or trick of your own! Then sign up for the SDK Newsletter! The SDK Newsletter is full of great stories, products news, designer spotlights, and...you guessed it...FREEBIES! Click here to sign up today! Here are just some of the freebies available in this months newsletter! Baby It's Cold Supa Digi Kit Freebies! Two new portions of this months Supa Digi Kit are now available in the SDK store! Kim has contributed this pretty pastel kit in shades of pink, yellow, blue, and green. 10 papers and 17 elements makes this a great addition to this months kit! Lorie's contribution of 5 cool papers and 8 elements in purples, greens, and glitter is sure to add a little sparkle to your layouts! Click on the previews to pick up these wonderful new additions! 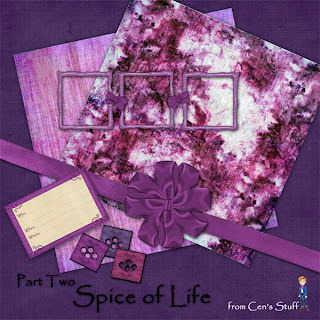 Stop by Cen's blog and pick up part 4 of her Spice of Life freebie! 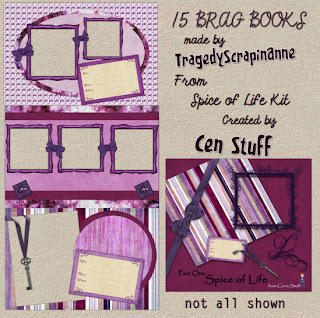 This amazing 15 page brag book was created by Cen's Loft CT member TragedyScrappinAnne using the first parts of the Spice of Life kit. Make sure you stop by her blog as well and leave her some love for this fabulous and generous freebie! Click the preview to visit Cen's blog! 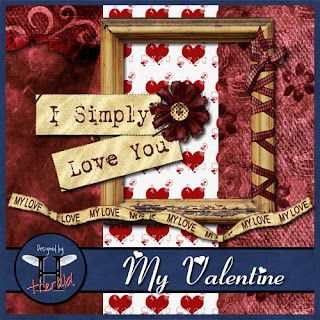 Be sure to stop by Herald's blog and pick up this wonderful freebie from her My Valentine collection! Then, swing by the SDK store and pick up the entire kit. This great Fun Time Quickpage with Bonus Brag Book Quickpage coordinates with Lorie's Fun Time Kit and is now available in the SDK store. While you're there, be sure to check out the entire Fun Time collection. Frames, Journaling Blocks, And A Blog Freebie! These great new products from Cen are now available at the SDK store! Button up your layouts with this sweet set of nine button frames. Lots of colour options to mix and match. The set consists of: 3 Heart Shaped Button Frames, 3 Square Button Frames, 3 Rectangular Button Frames. A great finishing touch to any layout. These journaling block are in three layers to allow you to add your own wording and drop shadows. Easy to assemble PNG files in four shapes and styles allow you to add a personal touch to your layouts. This set consists of: 1 Heart shaped pink block, 1 Round corrigated card block, 1 Square corrigated card block, 1 Rectangular green block. After you pick up these fantastic new products at the SDK store, be sure to stop by Cen's blog to pick up part 3 of her Spice of Life Freebie! ...with this great new kit by Doreen. 14 Papers (12x12; 300 dpi); 3 Buttons, 2 Cardboards; 3 Flowers; 2-12 Inch Bows; 1 Doodle; 1 Diamond; 1 Bead Chain; 1 Corner; 2 Ribbons; 2 folded Ribbons; 2 Ribbons with knot + individual Bows; 1 Needle; 1 Frame + wrap it Bow; 4 Tags and 1 Vellum. This is the perfect kit for scrapping heritage layouts. Click on the preview to pick up this wonderful kit at the SDK store! Check out these frosty new designs by Kim Smith! A girly wintery paperpack, Snow Princess will surely quench your thirst for papers that are not what you'd normally expect for winter. Hues of plum, hot pink, yellow, blue and tan, the 8 patterned and 4 solid background papers are fully textured in corduroy, denim and velvet. While the papers will warm your snowy and icy layouts, they're also suitable for other occasions. The Snow Princess Elementpack contains 37 coordinating elements including warped frames, boots, mittens and more! For a more masculine look, Snow Dude Paperpack contains 8 patterned and 4 solid backgrounds that will surely warm those wintery layouts. Created in shades of grey, tan, cream, green and blue, each paper is fully textured in velvet, denim and corduroy. The coordinating Snow Dude Elementpack contains 34 coordinating elements including snowflakes, leather and suede corners, belted buckles and more! Be sure to stop by SDK and check out all of our New Kreations! Check out this great new kit from Lorie! The Fun Time kit is jamb packed with 7 papers and 25 elements in light shades of browns and greens and comes complete with flowers, frames, ribbons, and more! The Fun Time Brag Book Set comes with six 6 X 4 coordinating quickpages when time is short. Click on the previews to pick up these wonderful new products at the SDK store! Yummy strawberries and vibrant colors of green and pink make Leslie's new kit Megan Rose a must have in your collection! These 8 papers and 17 elements are perfect for girly, summer, cooking or picnic pages! Click on the preview to pick up this scrumptious little kit! ...over these great new kits by Herald! Insane Frames and Masks is a set of 25 frames and 6 photo masks--a little bit crazy but a whole lot of fun! Insane Circles contains 30 circle shapes that you can fill with a patter, style, or and color you desire. Use them as frames or to add a little "insanity" to your layouts! Head on over to SDK and pick them up today! Valentine's Day is just around the corner and Herald has created a new kit for the occasion! My Valentine Paper Pack contains 35 soft and romantic papers suitable for Valentine's Day, anniversaries, weddings, or when you just want to scrap a layout of the one you love! The element pack contains 56 pieces and includes hearts, frames, word art and more! Pick these wonderful coordinating kits up today at the SDK store!